This is probably the one movie in Quentin Tarantino’s career that divides audiences most. There are critics and fans who love it for it’s laid back, character-driven approach and then there’s the ones who really don’t like it for it’s lack of energy or that Tarantino pop-culture referencing, larger-than-life aesthetic. I sit somewhere in the middle and even watching this now, I’m still unsure exactly how I feel. 70s Blaxploitation star Pam Grier plays airline stewardess Jackie Brown who gets caught by a couple of Feds bringing back $50,000 in cash in her luggage. Turns out she’s carrying it for local mobster Ordell Robbie (Samuel L. Jackson) and finds herself in a bit of a pickle when the feds want her to inform on her ‘business’ partner. Lucky for Jackie a kind natured bail bondsman Max Cherry (Robert Forster) is on hand to help. Now firstly my issue with this is usually what attracts me to a Tarantino flick – the dialogue. This time around occasional lines that I’m sure are meant to sound cool, come off more cringy when delivered by actors not best suited to Tarantino’s style. 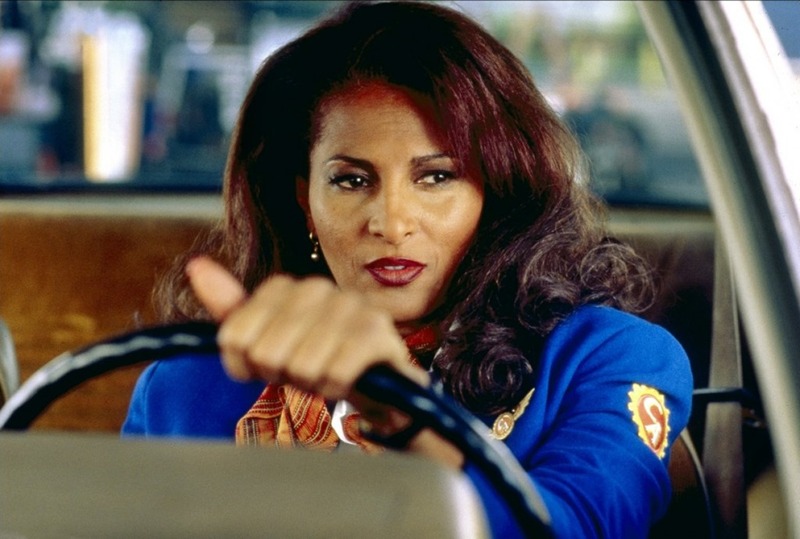 Pam Grier especially seems awkward or just out of practice, but thankfully fairs much better in her intimate exchanges with Robert Forster than attempts at sass with other characters. However Jackson of course is right at home and doesn’t put a foot wrong despite a rather bizarre ‘look’. Robert DeNiro is also here as Ordell’s buddy straight out of lock up, but seems to be (intentionally) sleeping his way through his performance, yet comes alive in the final act. Additionally Bridget Fonda plays stoner surf girl Melanie and looks gorgeous and makes for a fun character, but is mostly forgettable. So the show is left up to veteran actor Forster, who is easily the most likable and well rounded character and the viewer’s anchor to weigh all the other stuff down with. Quentin’s direction though is clearly a love letter to Blaxploitation and 70s TV cop shows, and with this he captures a perfect tone, decorated with various memorable Motown and bluesy tunes that really bring the movie to life and capture certain moments beautifully. Yet in the grand scheme of things, for me this is still his least engaging picture – it desperately needs a sharper knife in the editing room as it languishes in all but the final act – which at least proves dazzling, classic Tarantino. Following on from Pulp Fiction was no mean feat, and as with Hateful Eight following Django, this was a different beast entirely … but not without it’s merits. The Blu-ray is pretty decent with a very detailed and impressive image to the movie that although a little fuzzy and rough-looking in places, perfectly captures a 70s look. The DTS HD Master Audio is very clear and brings the various tunes to life. Adding to this are a wealth of extras with plenty of featurettes and documentaries both looking back at the movie and showing some behind the scenes stuff as well as deleted scenes. 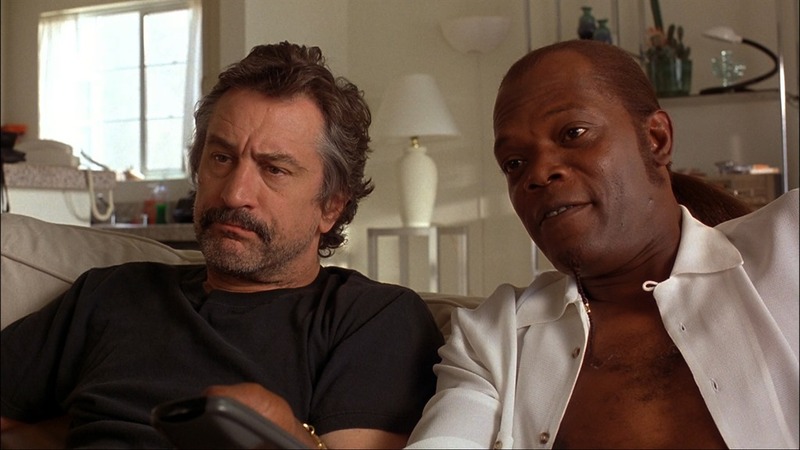 Jackie Brown is a peculiar beast as overall there is much to love but it doesn’t entirely come together as well as it should. Yet the Blu-ray does a decent job of disguising this and is still worth a look if you’re a fan of Tarantino. This entry was posted in Blu-Ray, Celebrity, Drama Reviews, Movies, Reviews, Thriller Reviews and tagged Bridget Fonda, Pam Grier, Quentin Tarantino, Robert DeNiro, Robert Forster, samuel L Jackson by Craig M. Bookmark the permalink. Insightful review. Loads of negative reviews have put me off seeing it. if you like his stuff…see it..just expect something very different. Great write up! I must say that I quite enjoyed this one – definitely very different from his other work, and while flawed, is still immensely entertaining.